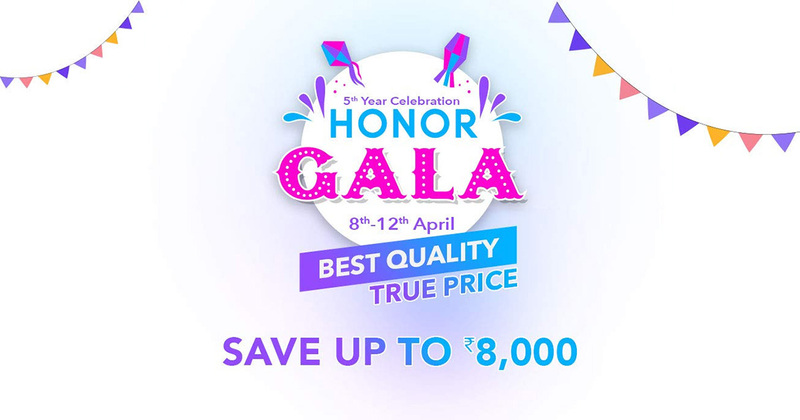 Amazon and Flipkart have brought the “Honor Gala Festival” which started on 8th April and will end on 12th April. The sale has already begun so interested users can grab the discounts on different devices like the Honor smartphones, wearables, and tablets, of up to 50 percent. It has been claimed that there will be offers provided worth Rs 50 crores. Both the e-commerce websites have disclosed the “Honor Gala Festival”. The official announcement was made via a press release which stated that “the Honor Gala Festival sale will bring offers on various Honor products, including smartphones, wearables, and tablets. Microsites on Amazon India and Flipkart”. The Honor Gala Festival is celebrating its 5th year giving best quality smartphones and true prices. Given below is the list of the smartphone that is getting discounts during this five days sale. The 4GB of RAM and 64GB of internal memory variant of the Honor 9N was launched with the price tag of Rs 13,999 and during the launch is available at just Rs 9,499. On the other hand, the 4GB of RAM and 128GB of internal storage variant can be grabbed at Rs 11,999 while its launch price was Rs 17,999. The 4GB of RAM and 64GB of onboard memory variant of the Honor 9 Lite during the sale is available with the price tag of Rs 9,499 while it was launched with a price tag of Rs 14,999. The price tag of the Honor 10 Lite for 4GB of RAM and 64GB of onboard storage variant during the launch was Rs 13,999 and during the five days sale, it is available at Rs 12,999. The Honor 7A with the 3GB of RAM and 32GB of onboard memory variant comes with a price sticker of Rs 6,999 while the launch price was Rs 8,999. The 2GB of RAM and 16GB of internal storage variant of the Honor 7S during the sale is available at the price tag of Rs 5,499 and its launch price was Rs 6,999. During the five days sale, the Honor 9i is present at Rs 10,999 for 4GB of RAM and 64GB of internal memory variant and it was launched with a price tag of Rs 17,999. During the launch, the Honor 10 for 6GB of RAM and 128GB of internal storage came at the price tag of Rs 32,999 while during the sale, it costs Rs 24,999. The Honor Play was launched with the price tag of Rs 19,999 for 4GB of RAM and 64GB of onboard storage variant. During the five days sale, the same variant can be grabbed at Rs 13,999. The Honor 8X with the 4GB RAM and 64GB storage was launched with price tag of Rs 14,999 while during the sale, it is available at Rs 12,999. Two variants of the Honor 7C are on sale i.e. the 3GB and 32GB of storage and 4GB and 64GB internal storage which costs Rs 7,999 and Rs 8,499 respectively. While their launch price was Rs 9,999 for 3GB / 32GB and Rs 11,999 for 4GB / 63GB variant. The Honor 8C comes with the variant 4GB and 32GB storage which during the sale is available at Rs 8,999 and during the launch, the same variant was priced at Rs 11,999. The Honor View 20 with 6GB RAM and 128GB storage can be grabbed with no-cost EMIs and an "extra Rs. 3,000 off on all credit card and debit card". The original price of the Honor Band 4 is Rs 2,599 and during the sale it costs Rs 2,499. The launch price of the Honor Band 4 Running Edition is Rs 1,599 while the discounted price is Rs 1,499. The Honor Watch Magic during the sale is available at Rs 12,999 while its launch price was Rs 13,999. The Honor MediaPad T3 10 Tablet can be grabbed at Rs 12,499 during the sale and its launch price was Rs 14,999. The Honor MediaPad T3 8 Tablet was launched with the price tag of Rs 12,999 and during the sale, it can be grabbed at Rs 9,499. Suhail Tariq, CMO -- Honor India said in the statement "In our endeavour to create products those are meaningful to our consumers' need and creating user-friendly technology interface, we have come a long way in India. Hence, we want to heartily thank our consumers by hitting the ground with the massive sale on our pre-eminent products from smartphones, wearable to tablets." This is not the first time that Honor has associated with Amazon and Flipkart but it has become a trend to attract the customers by giving them the greed of discounts.